Impress someone this Dreamy Birthday Celebration Gift Hamper and CCD Voucher that is not only classic but also one of a kind magnificent gift. This Birthday celebration Hamper comes with CCD Voucher (worth Rs. 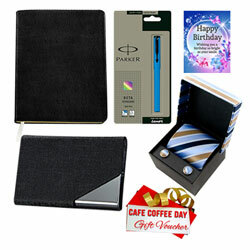 200), Parker Pen, Visiting Card Holder, Planner Dairy, Tie Cufflink Set and Birthday Card.